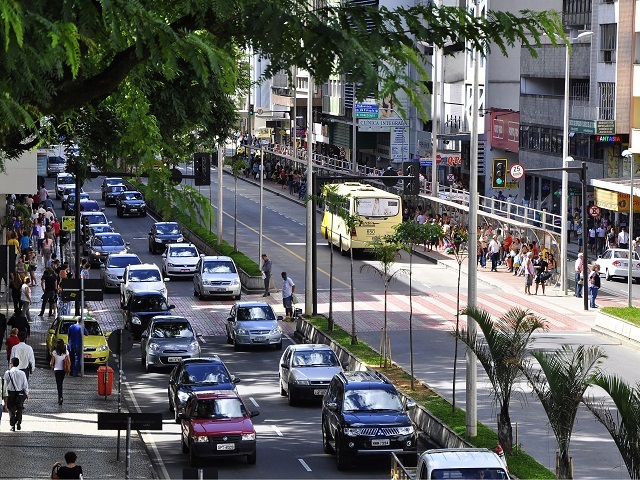 Rather than making traffic worse, complete streets—like this one in Juiz de Fora, Brazil—facilitate more efficient urban mobility by providing adequate, protected space for all. Photo by Mariana Gil/EMBARQ Brasil. Too many cities currently evaluate their streets in a way that doesn’t support long-term sustainability. The conventional approach centers exclusively on cars, and how quickly they can move up and down streets. Under this approach, a street receives an “A – F” grade based on its capacity to move traffic, suggesting that “failing” streets be widened to add more vehicle space and reduce congestion. However, experience shows that increasing road space for cars actually exacerbates traffic congestion. In order to develop a more sustainable transport system, we need to break away from this misguided approach. Sustainable cities require an approach to street evaluation that doesn’t just look at cars, but takes a holistic view of how pedestrians and cyclists use our streets as well. Many cities and metropolitan regions are looking to reduce their reliance on private cars and encourage more sustainable mobility options. In order for this transport vision to become reality, cities need dense urban cores with multi-modal, integrated transport networks. Therefore, planners and administrators can’t depend on tools that simply evaluate streets on the basis of how quickly they can move cars. Such an approach only encourages urban development on city outskirts where there is less traffic, and leads to sprawl rather than denser communities. How, then, should streets be evaluated to reflect the kind of streets our cities need to develop sustainably? What tools do cities need so that they know they are making progress toward achieving long-term sustainable mobility for all? Both New York City and Copenhagen have developed great methods for sustainable street evaluation. Although both cities already have reputations for offering high quality, sustainable transport, the tools they have developed represent a noteworthy step forward, and can be adopted by cities worldwide. By introducing a diverse range of indicators, their approaches enable planners and city leaders not only to critically analyze streets, but also to communicate important information back to the public in easy-to-understand ways. Their frameworks are holistic and center on urban transport, but involve a variety of perspectives on factors like economics, the environment, and safety. This diverges from the conventional approach by presenting comprehensive data points that anyone can interpret. 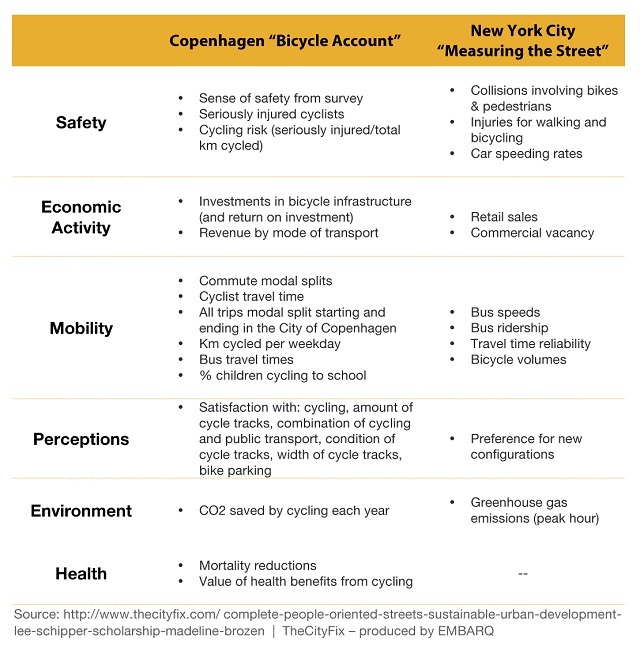 Complete information can be found in the reports “Measuring the Street” from New York City and the “Bicycle Account” from Copenhagen. For a quick reference, the following table is a catalogue of each city’s major data points. Neither approach focuses exclusively on a single mode of transport. Instead, these frameworks take into account public transport users, pedestrians, cyclists, and car drivers alike. Both frameworks look at more than just the street itself, and include the connection between transport and the built environment through economic analysis. Notably, the frameworks include public opinion—an important qualitative factor that is disregarded in the simplistic A-F model. Both cities conduct surveys to learn what residents think about their city streets and how they actually use them. This is a novel, yet imperative, step in addressing street design and how it contributes to sustainable cities. Lastly, and arguably most importantly, both of these lists reflect the complexity of urban streets—a stark contrast to a single letter grade. How can cities around the world use this information to develop sustainably, efficiently, and equitably? Start with the categories identified in the table above and collect data, where possible. Second, do not discount the opinions of city residents and people who actually use streets on a daily basis—this is valuable information. Finally, each city should ask the critical question: can we use this data point to improve our streets and city? If the answer is no, then select a different data point to collect and analyze. Collecting data for data’s sake is not the goal of this process. Rather, the aim is to understand how cities can use comprehensive data to create streets that are offer people safe, sustainable, attractive, and convenient mobility options.